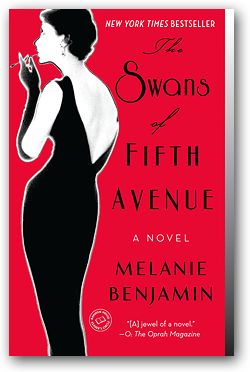 The questions and discussion topics that follow are intended to enhance your reading of Melanie Benjamin's The Swans of Fifth Avenue. The Swans all have very complicated relationships with one another—perhaps most notably, Slim and Pamela were both married to the same man. What ties these women together, despite their differences and the sometimes competitive nature of their friendships? Truman is embraced wholeheartedly by the swans when he first appears on the New York social scene. What do you think draws them to him? Discuss Babe's marriage with Bill. What are its strengths? What are its weaknesses? What do you think of Truman's relationship with fame? At times, he seems willing to sacrifice almost anything (love, his health, and his friendships) in pursuit of the limelight. How does that serve him, ultimately? Why do you think Truman published La Cote Basque, 1965? What point was he making about (or to) the story's subjects? Truman and Babe were both heavily influenced by their mothers. In what ways were their childhood experiences similar? In what ways were they different? Babe and her sisters were raised for successful marriages. Did they live up to their mother's hopes? Pick three words to describe Truman and Babe's friendship. Or, pick one word to describe Truman, one to describe Babe, and one to describe their friendship. Do you think Babe forgave Truman, in the end? There are a number of stories told throughout the novel. What are some of the stories that you tell—about yourself or about others? In what ways do stories shape our experiences? Who surprised you the most? Why? Aging is a prominent theme throughout the novel, as the opulent 50s come to an end and a new generation of socialites supplants the glamorous Swans. What did you think of that? How do you feel about getting older? Discuss the significance of memory in this novel. In what ways do we distort our memories? What, if anything, is the significance of this? Can you think of a woman who is the modern equivalent of Babe Paley and her circle of friends? Babe always presents a very carefully composed face to the world. Only occasionally do we see that mask slip. Discuss those moments. Who is the real Babe, beneath the makeup and jewels? How has the role of women in society shifted from the 1960s to today? If you have read any of Melanie Benjamin's previous books, compare and contrast this work with her earlier novels. Is this story a departure? If so, in what ways? If not, how is it in keeping with her other writing?